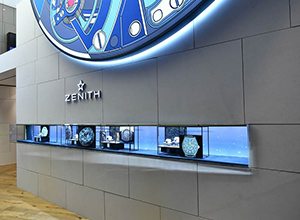 ZENITH is writing its future… and the future of Swiss watchmaking. Yes, the brand with a guiding star is creating nothing short of a galactic explosion in the watchmaking universe with the launch of a whole new dimension in mechanical precision! 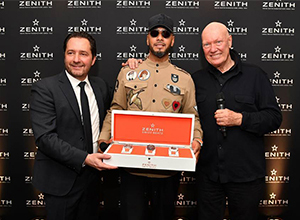 Such was the thrust of ZENITH’s Baselworld 2018 kickoff press conference on March 21st, hosted by the President of the LVMH Watch Division, Jean-Claude Biver; ZENITH CEO, Julien Tornare; and attended by friends of the brand including recording artist and producer, Swizz Beatz, along with the well-known photographer, biker and enfant terrible, Dimitri Coste. The event was held on the booth which has evolved in a new and forward direction. Visitors were immediately struck by a bold outsized visual of the Defy El Primero 21 movement featuring dark modern tones evoking the new collection and the brand’s fresh future-driven momentum. In addition, a dedicated Defy Room invited them to enter an extremely dark universe featuring six portholes with a fast-rotating mechanism creating luminous graphics. For anyone who approached to within 1.5 meters, the sequence would stop and one of the six different models thus presented lit up to become clearly visible in startling detail. 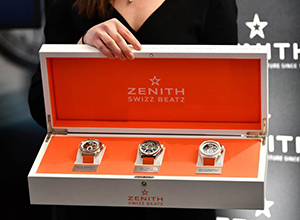 This powerful sensory experience instilled a distinctively dynamic and on-trend atmosphere that set an effective stage for these charismatic and resolutely upbeat timepieces. The Defy Room sound track has been specially designed by Swizz Beatz to match the resolutely experimental, contemporary urban atmosphere of this Baselworld must-see.